January 17, 2018 – Saturn’s moon Titan may be nearly a billion miles away from Earth, but a recently published paper based on data from NASA’s Cassini spacecraft reveals a new way this distant world and our own are eerily similar. Just as the surface of oceans on Earth lies at an average elevation that we call “sea level,” Titan’s seas also lie at an average elevation. This is the latest finding that shows remarkable similarities between Earth and Titan, the only other world we know of in our solar system that has stable liquid on its surface. The twist at Titan is that its lakes and seas are filled with hydrocarbons rather than liquid water, and water ice overlain by a layer of solid organic material serves as the bedrock surrounding these lakes and seas. The new paper, led by Alex Hayes at Cornell University in Ithaca, New York, and published in the journal Geophysical Research Letters, finds that Titan’s seas follow a constant elevation relative to Titan’s gravitational pull — just like Earth’s oceans. 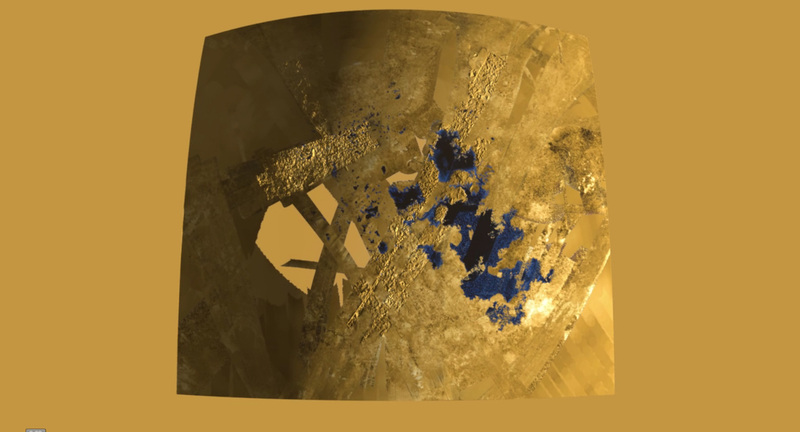 Smaller lakes on Titan, it turns out, appear at elevations several hundred feet, or meters, higher than Titan’s sea level. Lakes at high elevation are commonly found on Earth. The highest lake navigable by large ships, Lake Titicaca, is over 12,000 feet [3,700 meters] above sea level. The new study suggests that elevation is important because Titan’s liquid bodies appear to be connected under the surface in something akin to an aquifer system at Earth. Hydrocarbons appear to be flowing underneath Titan’s surface similar to the way water flows through underground porous rock or gravel on Earth, so that nearby lakes communicate with each other and share a common liquid level. The paper was based on data obtained by Cassini’s radar instrument until just months before the spacecraft burned up in the Saturn atmosphere last year. It also used a new topographical map published in the same issue of Geophysical Research Letters.